With back to school looming on the horizon, thoughts often turn to backpacks. We find that so many kids are carrying loads that are far too heavy – 25-30 pounds in some cases, which is about half the weight of some children! That excess weight puts enormous stress and strain on a child’s spine, resulting in posture issues, pain and more. Over time kids can develop headaches or neck or back pain. Many children also will carry their backpack on one shoulder, which can cause muscles to be used differently and their hips to be off. Keep it close. 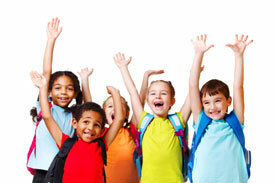 Encourage your child to carry their backpack as close to the body as possible. The straps should be tightened for a snug fit. Don’t carry anything extra. Scientific evidence shows that even five pounds of excess weight on your joints can create problems. Therefore, ensure that your kids only carry what’s necessary and leave heavy items like laptops at home. You also may want to consider keeping an extra set of their books at home. Take an even-handed approach. While it may look cool to sling a backpack over one shoulder, it’s important that your child distributes the weight evenly by putting the backpack over both shoulders. Also, it’s a good idea to pack heavier items closer to your child’s body. Get rolling. By choosing a backpack with wheels, your child can limit the amount of time it’s carried throughout the day. Free Backpack and Posture Checks! If your child is experiencing back pain from carrying a backpack, we encourage you to contact the office. Addressing pain right away is important to help prevent further problems. We can also provide a backpack and posture check during the month of August to help ensure that your child starts the school year as healthy and strong as possible.